Who loves swimming pools? If you do, then this is for you. I was mad when I started doing my research about pools. Well, swimming is not actually my forte and I hate drowning, but I’m always fascinated about various wonderful places. So here, I gathered some of the most outstanding and world-class places where you might think to stop over and spend your unforgettable getaway. Meet this extraordinary collection! This is amazing pool nestles deep in the heart of a five star luxury hotel, sizing 3.2 hectares. As you can see, there is another pool cascading the first one at the top. There are two stunning pools all in all. While swimming, you’ll have the best scenery to fall in love with. You can gaze with the outstanding forest surrounding the entire place. Feel the nature and experience the beautiful soul in the place. And for your information, this was voted as world’s best swimming pool. 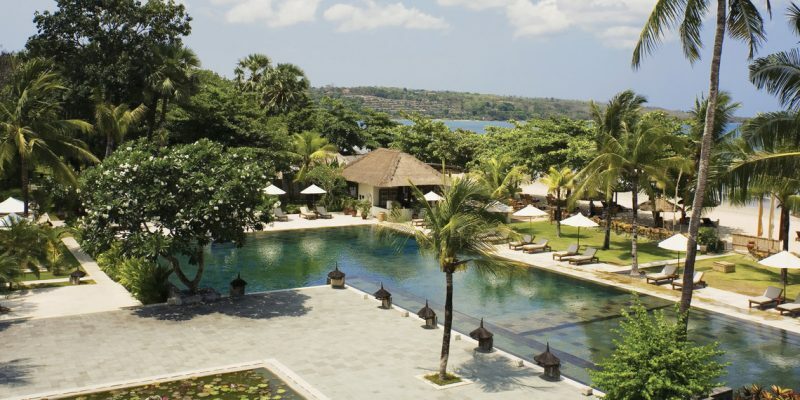 This marvelous infinity-edged pool is an emerald oasis in the heart of a resort in Belmond Jimbaran Puri. You will fall into captive with the resort’s natural beauty; where flowers bloom beautifully at the edges, and where tall mountains welcome you with pleasurable breeze. The pool is beside the sea so at the same, you will the great oceanic ambiance of the place. It’s like swimming in piles of gold when you set your feet on this amazing golden pool of Tibet. The temperature was set to 28-32℃ that guarantees comfort for guests. Here, you can have all the foot massage experience you ever wanted, while enjoying the meal of delicious food and drinks on the comfortable cabana-style seating. But warning, though. Children below twelve should be accompanied by an adult in the pool area as running and diving are both not allowed. Swim on top of the world as this pool is located 57 storeys above the ground. Architect Moshe Safdie designed it. The incredible pool was made 150 metres across Sands Skypark. It is located in a 5-star hotel in Singapore. Amazing as it seems, but if you are someone who is afraid of height, you should think it over of whether or not you wanted to swim on this pool at the top of the world! Enjoy the beauty of the sea while having your wildest swimming experience here in Maldives. It has gentle sands that lead you to the water’s edge. The water is uniquely located near the beach, with an amazing scenery. If you deem for an absolute exotic pool experience, you should definitely come into this place. But aside from the pool, you can also swim on the beach if you wanted to. So have you picked your choice? The most outstanding feature of all these pools is their super clean water, coming from the most trusted water filters. By this, the water guarantees a healthy swimming experience for guests. So save your money now and make your reservations on one of these world-class pools around the world.